For almost thirty years, doctors and scientists have been researching the effect of Human Growth Hormone (HGH) on older people. Following a 1990 article published in the The New England Journal of Medicine, human growth hormone injections surged in popularity. The article cited outstanding results for men over age sixty who were treated with HGH. With no changes in diet, muscle mass increased by an average of 8.8% and body fat decreased by 14%. Participants’ skin thickness increased by more than seven percent. In the wake of these discoveries, firms began to introduce dietary supplements containing precursor hormones, amino acids, and vitamins claiming to offer the same beneficial effects of growth hormone injections. But these products fall short because they’ve never been clinically proven or tested. That’s what makes ProBLEN different. In a five-month clinical trial, ProBLEN HGH has been clinically proven and tested to more than double the average HGH levels. In a double-blind, placebo-controlled, five-month clinical test published by a peer-reviewed professional medial journal, ProBLEN’s HGH was affirmed as an effective, non-injection way to increase HGH levels. In fact, each participant in the study increased their average HGH level by 130.8%. To the best of our knowledge, this is the highest increase in efficacy ever achieved by a non-injected human growth hormone remedy! In addition to more than doubling the growth hormone level, the clinical test showed that ProBLEN HGH reduced excess body fat by more than 25%. Plus, three out of four users of ProBLEN HGH also experienced significant improvement in many other areas of life from younger looking skin to enhanced sexual energy and function. The proof is in the research: ProBLEN’s HGH is a clinically-tested and effective way to safely and naturally boost HGH levels and experience benefits of living young and aging well. A medical doctor engaged in treating geriatric patients and in geriatric research conducted this clinical trial. The study was neither designed nor executed by Liddell Laboratories. The trial sample consisted of 21 healthy adults aged 45 to 86 with below normal levels of growth hormone. Subjects were randomly assigned to one of the three different groups. Groups 1 and 2 both received PROBLEN HGH with human growth hormone, while Group 3 received a placebo. Growth hormone blood levels, as determined by IGF-1, were measured at the start and five months later at the conclusion of the trial. (It is interesting to note that the increase in HGH blood levels was virtually identical for Group 1 and 2). In clinical trials of remedies for chronic conditions, the duration of the treatment with the study drug is important. Based on his extensive experience in treating the elderly, the doctor who designed and executed the clinical trial pointed out that limiting such trials to a matter of weeks could short-term variations in blood levels making it impossible to draw meaningful conclusions. He felt that 4 months should be sufficient to generate stable, accurate, dependable results, but suggested adding a fifth month for added security. He also stated that a five-month trial is definitely superior to the four-to-six-week trials conducted by other non-injected growth hormone products. Secreted by the pituitary gland, Human Growth Hormone (HGH) is responsible for maintaining growth during childhood and adolescence. As we age, the amount of HGH our bodies produce declines. Starting at age 20, a person’s blood level of Human Growth Hormone (HGH) begins to fall significantly. After age 30, our production of HGH slows by about 14% each decade. By 40, most of us feel the difference and, by age 60 we’ve likely lost 75% or more of our ability to secrete HGH. But HGH’s job isn’t finished when we’ve reached our adult stature. In fact, throughout our lives, HGH affects just about every cell in our body. It has a major impact on how we look, act, and feel. HGH can play a vital role in turning body fat into energy. When your systems need energy, your body chooses what to use to produce that energy. HGH stimulates your body to burn fat as fuel rather than carbohydrates and protein. HGH also helps build muscle. Building muscle requires protein and it’s HGH that increases the cell’s content of amino acids—the raw material cells use to make protein. Likewise, HGH helps you maintain the muscle you gain. It prevents the breakdown of proteins and amino acids, helping minimize muscle loss. HGH stimulates the liver and possibly the kidneys to increase the production of somatomedin. Somatomedin, in turn, promotes the deposition of chondroitin and collagen, two essentials for proper formation and maintenance of healthy bones and cartilage. Skin appears old and wrinkled for one main reason: It’s thin. HGH impacts production of somatomedin that is responsible for generating thicker, less wrinkled, and younger looking skin. In Fact, eighty-six percent (86%) of female ProBLEN HGH users reported younger looking skin after use. ProBLEN HGH with Human Growth Hormone 30X fights the most significant and harmful effect of aging. From depressed mood, low energy and poor sleep, to low libido and sexual function, aging slows us down and decreases our quality of life. You don’t have to sit idly by and swallow aging’s slow death sentence. Though there’s no scientific evidence that HGH will increase the number of years you live, there is plenty of evidence that HGH can make those years healthier and more enjoyable. PROBLEN HGH contains a 30X potency of human Growth Hormone (HGH) and also contains pituitary and liver extracts. 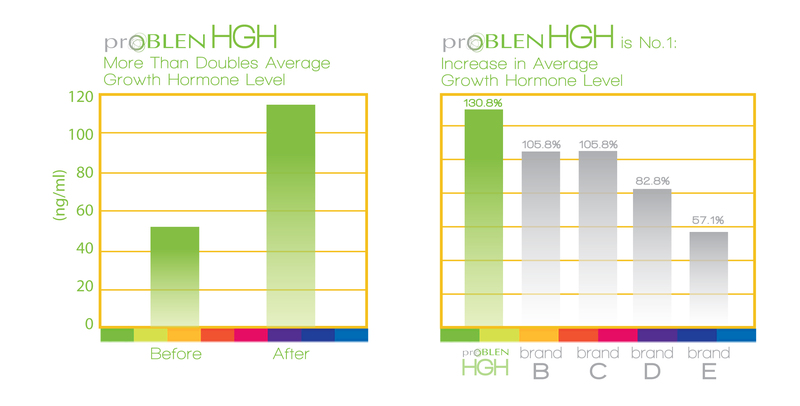 ProBLEN’s HGH booster augments the pituitary’s output of HGH and helps balance the secretion of other pituitary hormones. While liver extract stimulates the liver, to buffer glucose levels and help regulate your blood sugar. While the increase in the growth hormone blood levels was truly significant, at no time during the trial did growth hormone blood level of any test subject exceed their normal reference range, and there were no side effects of any kind. The Human Growth Hormone in ProBLEN HGH starts with actual laboratory recombinant human growth hormone cells originally derived from the blood of healthy human beings. The original cells were tested to make certain they were clean and free from disease. Then, they are reproduced by a laboratory process that grows identical copies of the original cells in a bed of yeast. It is the same HGH that the laboratory supplies to doctors for injection therapy. The pituitary and liver extracts are prepared under sanitary conditions by a leading pharmaceutical supplier. The pharmaceutical firms that supply them are registered and inspected by the United States Food and Drug Administration. Now, at a fraction of the cost of injection therapy, women and men 35 and older can enjoy the benefit of Human Growth Hormone supplementation. PROBLEN HGH is an easy-to-use oral spray formulated by our doctor to relieve some of the unpleasant symptoms of aging such as lack of energy, impaired sleep patterns, and poor muscle/fat balance. PROBLEN HGH safely and naturally increases HGH levels. And, ProBLEN has proven results. No other non-injectable growth hormone product can equal ProBLEN HGH for proven efficacy. And it is as safe as it is effective. No wonder it is the world’s best-selling, non-prescription human growth hormone remedy. See how ProBLEN HGH can help you live young and age well.